Why do fools rush in? What is it with us, fans of horror films? Why do we sit through hours of drivel to get our fix, why do we rush to watch films upon their release knowing full well they are going to be rubbish? I cannot think of a genre which has more devoted, forgiving fans. Perhaps it is because, even within a poor film, we hope to find a decent quota of bloody mayhem, enough to satisfy us. 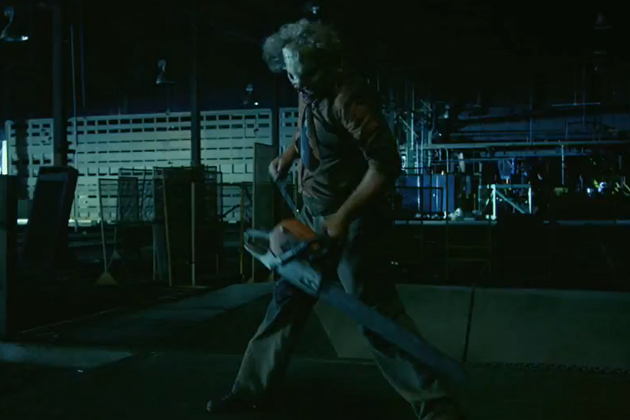 So The Texas Chainsaw 3D. Bloody perhaps, fun, definitely not. Somebody decided it was high time to milk the cash cow yet again because idiotic fans like myself were bound to rush in. Wisely ignoring the three sequels, the remake then the remake's prequel, this presents itself as a direct sequel to the original, and manages to offend within mere seconds. The director thought it would be a good idea to insert all the murder scenes from the 1974 film in the opening credits. Except that this new film being in 3D, they are retro fitted in 3D too. And they look awful. It reminds me of this tragic trend in the 80's of colourising black & white classics, you just don't mess with classics. Then the first gapping plot hole becomes apparent straight away. I am not too bothered about timeline when it comes to sequels, prequels etc... usually, it is pointless to get annoyed and get into too much scrutiny with horrors. But if you are going to include scenes from the original set in the 1970's, follow them right up with scenes of your own with actors made to look like their original counterparts in a prologue, and then set the action 20 years later, why on earth have characters use i-phones? Or this is set in the 90's, you know, when i-phones first came out (not!). Plus if we are indeed in present time, then there is a big problem with the age of the main protagonist. This is one of the many evidence of either the shocking disregard from the makers towards their audience, or their total idiocy. And it does not get better. Here we learn that right after the original massacre, local folks exacted a brutal revenge upon the murderous family, killing them all by torching their house bar a little baby girl who was rescued. Fast forward twenty years (or forty, who knows) and the baby girl has become a teenager (Alexandra Daddario) who finds out that she was adopted and is set to inherit from her grand mother. She embarks on a road trip with her friends to discover the truth about her origins and her real family, getting much more than she bargained for in the process! After this exposition, which includes the introduction of the obligatory mötley crüe of horny teens (who actually hardly seem to bother to come across as horny at all), comes a rather predictable second act of carnage. A character who seems to be a carbon copy of Brad Pitt's small time crook in Thelma & Louise literally drops by out of nowhere and join them, to be then promptly despatched, probably to make up the of couple of scenes missing to reach the standard ninety minutes running time. Here again director shows its appalling lack of talent. Much was said of the Marcus Nispel remake of 2004. 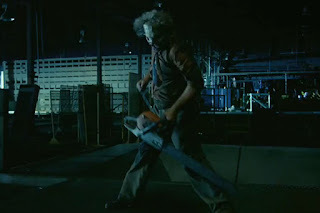 But at least it was enjoyable in a guilty kind of way, delivering some rip roaringly fun scenes of Leatherface wielding his chainsaw and chasing his victims. Here the masked killer barely seems to bother, not even running much or offering any kind of threatening presence. Rarely has a film shown so little sense of tension and scares, and despite a few scenes of satisfying gore, many deaths are of the most boring variety: death by car crash, death by bullet in the head... In a film called Texas Chainsaw 3D! 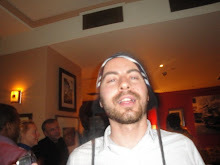 Speaking about the 3D, it is as limp and lifeless. When the guilty pleasure that was My Bloody Valentine 3D a few years ago managed to have a lot of fun with its 3D (actually still one of the best use of the format I have seen, and I am being serious) and its inventive deaths, here, bar a couple of scenes that see the chainsaw points at the audience or be thrown at us, you would not have a clue that this is not 2D. And this is not even as fun as it sounds, as if the 3D novelty had long evaporated. Finally, just as you think this cannot get any worse, the third act, which I will not spoil, takes the films into further idiotic territory, adding one of the most laughable character ark ever to grace the screen. Somewhere, somehow, it might have seen an interesting idea to try to take the franchise into a different direction but here it is woefully misguided, making me want to throw popcorn at the screen with anger. And I don't even buy popcorn at cinemas. As a final blow, giving its early box office success (over $10M on its first Friday in the US, the film costed $8M to make...), one of the producers has claimed that it intends to make this the new Saw franchise... Like they said in Event Horizon, Liberate tuteme ex inferis! With Texas Chainsaw 3D we have reached a new low in horror. We have already suffered a wave of tragic remakes of classics. Now we are entering a new phase, which will actually makes us regret the remakes. And that is saying something. At least I can safely say that my first film of 2013 is also the worst, and it can only get better... surely?